While solar energy use in the USA has been stagnating for years, use of solar energy in Kenya has exploded. Why? Because solar energy delivers cheap, reliable energy and Kenya is located on the equator. 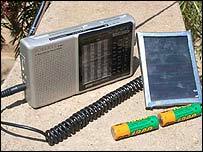 Solar energy devices are cheap to produce, easy to use and require little maintenance. It is only during the rainy season (mainly March to September) that there may not always be enough sunlight to operate solar devices. Access to regular supplies of electricity has increased in Kenya: 44% of the population now have access, versus 23% in 1970. However, many rural communities may never get access as this is very expensive and requires heavy government subsidies. Fewer than 2 percent of Kenyans in rural areas are served by the national grid. In such a situation, solar energy in Kenya can be of help. Solar energy can take many forms. Since about 1995, Princeton University (USA) has been involved in the introduction of solar cooking ovens into rural communities. Solar ovens can replace wood ovens, which are now the main type of oven used by poor Kenyans – the majority of the population. A solar oven is actually very simple: a portable box that converts sunlight into heat using a special kind of foil. A basic model was already described in the Scientific American magazine in 1884. University staff members are winning over local communities by simply cooking for them using the new ovens. Then the staff members organize and train local communities to further spread the use of solar ovens in their area. Thanks to Solar Cookers International – a Californian firm – a reported 10,000 Kenyan families were using solar ovens in mid-2006. A major disadvantage of solar cooking, however, is that it takes much longer to cook something. It takes, for example, 50 minutes to boil 2 liters of water. Cooking food can thus take several hours. In one of Nairobi’s large slums – Kibera – a group of young Kenyans have set up a workplace that produces small solar cell panels. These can generate enough electricity to operate a radio or charge batteries or mobile phones. They sell the solar systems for 5 dollars (the average income in Nairobi is around 1 dollar a day). Many of the workers have found their first job in this company. They were trained by a British volunteer who picked up his knowledge in Tanzania. Virginia Tech University (Blacksburg, USA) is currently working to put a Kenyan hospital on solar energy. Currently, the hospital can only give first-aid. With solar energy the hospital will be able to expand its services considerably. Kenital Solar is a Nairobi-based company which produces a whole range of solar energy devices, including solar pumps for pumping water, solar fridges (!) used to keep vaccines cool in hospitals, solar lighting and electricity systems for homes, schools etc. and solar radio and satellite communication systems. It has produced pump systems that can already pump up water using 2 solar modules of 80 Watts each. Standard street lighting poles already produce light with one 75 Watt solar module. All in all, an estimated 100,000 solar home systems have been installed in Kenyan houses. The majority of these consist of a small 12-14 Watt photovoltaic panel. So solar energy in Kenya seems to have a sunny future... I'm happy to report that these developments have begun to expand to neighbouring Uganda as well.